If you can post the content of a book to a blog as you develop the book, why not a film? That's precisely what Scottish film director David MacKenzie is doing with the script for Hallam Foe, a film based on the novel by Peter Jinks. [...] So here's what we decided. Like I said, filming begins in January. Between now and then David has to do one more major re-write. The script in its current form is on a Word Document here. Feel free to download it and tell us what you think. David doesn't have a blog himself, but he'll be happy to answer questions in the comments. From my perspective, it's no-brainer. The idea is to get the script "out there" to the world at large as early on as possible, so if there's anything wrong with it, at least it can be fixed. The earlier you get your audience involved with the marketing process, the easier and cheaper it is. Most film marketing is, to quote David, "Too little, too late". The interesting thing for me is we're not just trying to use blogs to pimp a movie. We're trying to use blogs to actually help the making of a movie. Not only that, this isn't a low-budget indie art-school project. This is a commercial, mainstream movie from an established director doing the Cluetrain thing. One interesting additional possibility here is that the film could have multiple plots and/or endings. "Bloggers' Cut" as well as the director's cut, so to speak. The film could even be released over the net as well as via the film studio's usual channels. No Hollywood studios involved - Film Four and Scottish Screen, according to IMBD. Nimble companies, should be easy to consider and decide. Now that would be really Cluetrain. Ten days after it opened, I finally managed to see Star Wars: Episode III - Revenge of the Sith yesterday. And what a phenomenal film it is! If you haven't seen it yet, do go. And if you do plan to and don't want any spoilers, then don't read the rest of this post. There are plenty of film reviews out there, and plenty of different individual opinions about the film, the acting, the dialogue and the special effects - try these, for example. I thought all of it was simply terrific. Two things struck me especially strongly about this film, both to do with acting and characterization. The first is the brilliant portrayal of Anakin Skywalker by Hayden Christensen. This is an actor who without doubt has grown substantially in ability since his first appearance as Anakin Skywalker in Star Wars: Episode II - Attack of the Clones three years ago. In this latest film, he is believable and makes for compelling watching as the tortured and lost soul who is Anakin Skywalker and who becomes Darth Vader. Watching him progress from confusion and doubt (about himself, primarily) to warped denial and the awful catalyst for the eventual death of his pregnant wife Padmé Amidala (acted by Natalie Portman) was quite something. Deep and dark, definitely not a film for small kids. The second thing is the relationship and inter-reactions between the characters of Anakin Skywalker and Chancellor Palpatine, played equally brilliantly by Ian McDiarmid. Seeing one human being consistently manipulating another in the pursuit of raw and absolute power was quite breathtaking. Great acting means acting a great story, and this film is that. Yes, I've read some reviews and commentaries that talk about wooden acting and lame storylines. I don't agree at all, but that debate will have no end. For me, this film - and all the Star Wars films - are simply a great story, a variation on a timeless theme about good and evil, love, trials and tribulations, having dreams and vision, and so on. It's a winning formula, every time. I thought the final part of the film, following Anakin's conversion into Darth Vader, set a pretty seamless transition to Episode IV, the original Star Wars film released in 1977. How the newly-born Luke and Leia were separated to protect them from their father, Darth Vader on the bridge of a star destroyer, the crew below in uniforms that were those in the later (original) films, the partly-built Death Star visible through a window - all elements that bridge the gap between this last of the new trilogy with the first of the original trilogy. Just over a week to go until Star Wars Episode III Revenge of The Sith opens! The fans who have been camping out for weeks in front of cinemas across America will not be disappointed. Lucas has created an eminently satisfying, albeit surprisingly violent, final instalment that brings the story back full circle to the first film. It contains all the ingredients that fans have come to expect: aerial dog-fights, swirling light-sabres, Jedi battles, evil droids - and it packs an emotional wallop. Talking about camping out, check to see how Jeff Tweiten's doing - he's been camping out in Seattle since January waiting for the opening. Last night I listened to a 50-minute commentary (MP3, 35.7Mb) by Jason Calacanis who saw the movie a few days ago. It's a good personal insight. (Interesting to hear lots of music from the movie soundtrack in Jason's MP3: if it's not Creative Commons, I hope you got permission, Jason!) Like him, I'm a big Star Wars fan - I was at the opening night in London of the original first episode in 1977. I've seen every episode, I've worn out all the VHS tapes and I now have all the DVDs. Is Episode III the best one in the saga as Jason and many others believe? Not having yet seen it, I can't judge that. But not long to wait. Meanwhile, you won't be able to miss the blizzard of TV and other advertising starting to come your way in major markets where the move will play, from official trailers through to sponsors' promotions. And it's the cover feature in this week's Time magazine. Will Paris' podcast have character? Podcasting is hot. But it just got hotter. Paris Hilton invites you to join her on "The Paris Hilton Podcast -- Countdown to House of Wax," beginning on April 29. Join Paris and friends as she shops, parties, poses and publicizes in the days leading up to the May 6 opening of House of Wax. I suppose you could argue that it could be a 'character blog' in that the site (it's not a blog) and the podcast center around the actor playing one of the main characters in this horror flick (R rated in the US, but only a 12 in The Netherlands - go figure) that opens in much of Europe towards the end of May. Yet as the podcast's protagonist is a real person, ie, Paris (according to the blurb on the site), it can't be a character. But if the real person is playing the role of the character, maybe it could. That's actually a silly and pointless argument. I don't believe it would be regarded as a 'character blog' at all (anyway its the podcast that's the focus, not the website) as it clearly looks like its the actor and not the character who is the star of the audio show. And everyone will know that. Whatever it turns out to be, I'm impressed with how Warner Bros is developing this promo vehicle for the film to embrace wide-ranging communication channels. There's already quite a bit of reporting by mainstream media about the podcast. And lots of buzz in the blogosphere. Adam Curry had a paid commercial on Wednesday's Daily Source Code (MP3, 15.6Mb), which he says is his first paid ad. He's hoping to interview Paris tonight (US time) about the podcast. Pretty good audience targeting, I'd say, especially via the Daily Source Code. The House of Wax Podcatcher helps you find, subscribe to and download podcasts onto your portable media player. Using RSS technology, podcasts are audio distributed in the MP3 format and will play back on any portable media player. The House of Wax Podcatcher comes pre-loaded with "The Paris Hilton Podcast." Some imaginative integrated marketing and communication going on here. It certainly has character. Incidentally, stay tuned to Adam Curry's website in the coming days. He's about to make some announcements re the Podshow offering that he's been readying for kickoff. Plus he's developing a new podcasting application called CastBlaster which has just entered a closed beta testing phase. So what about 'character blogs'? Well, in spite of the many posts defending them, I will stick to my guns: I believe character blogs are a waste of everyone's time. Certainly every one I've seen so far is exceedingly lame. So I'll stick with what I said last week: just because you could doesn't mean you should (there's a definition of character blogs in that post). With Star Wars Episode III - Revenge of The Sith just months away (opening in most countries on 19 May, to be exact), the February edition of British Vanity Fair magazine has a terrific 4-panel panorama foldout cover photo spread of the main stars, current and original trilogy, with photos taken by Annie Leibovitz. Ewan McGregor, Hayden Christensen and Natalie Portman teamed up with other stars of all six Star Wars movies for the photo spread. The magazine grouped together 22 major performers from the legendary franchise, including Samuel L. Jackson and Liam Neeson, also inviting Harrison Ford, Carrie Fisher and Mark Hamill, stars from the original 1977 film, Star Wars Episode IV - A New Hope. 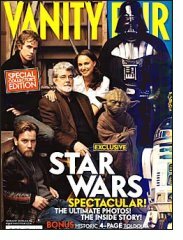 Mastermind George Lucas, who directed four of the intergalactic movies, joined the stars together with robots R2-D2 and C3PO for the reunion cover shoot. If the return of Darth Vader doesn't make StarWars: Episode III- Revenge of the Sith irresistible, an army of Wookiees should do the trick. Jim Windolf gets a preview of the epic's final instalment from an unusually candid George Lucas, who reveals the true nature of his helmet-headed villain. And, there's now a teaser trailer. As you may tell, I'm a big Star Wars fan. Not as big, though, as Jeff Tweiten who I wrote about last month and who's been camped out since the beginning of the year in front of the Cinerama Theater in downtown Seattle (he's now moved to the IMAX), waiting for Episode III to open. You can follow Jeff's quest in his blog, Waiting for Star Wars. Komo News: Are you ready for Star Wars: Episode Three? Don't get excited just yet, the new movie doesn't open until May. But for one Seattle fan, it's never too early, or too cold, to start the wait. Jeff Twieden [sic] doesn't care that it's freezing outside. He's camping out in front of the Cinerama Theater in downtown Seattle, waiting for Episode Three to open. It's only 22 weeks away. Follow me, Jeff Tweiten, as I wait in line for 5 months in front of the Seattle Cinerama theatre for the opening of Star Wars Episode III: Revenge of the Sith. May the force be with you, Jeff! We went to see The Incredibles yesterday which opened in The Netherlands last Thursday. I'd agree with every comment I've seen on many blogs already - an astounding film, definitely worth seeing. From Pixar Studios via Disney, who did Toy Story, A Bug’s Life, Monsters Inc and Finding Nemo. If you’ve seen any of Pixar’s previous films, you’ll know what to expect – a superb film, amazing animation and a good story. This one is no exception. One good way to judge that is how the audience reacts. We saw the original English-language version; it’s also on release here in Dutch. So there we were in the Pathe de Munt cinema in Amsterdam, in Screen 4 that was totally full. Not an empty seat anywhere. Adults like us as well as families with lots of kids. The kids adults (let’s be honest here!) in particular were enthralled. When the film ended, the chit-chat from everyone filing out of the cinema was interesting to listen to: kids mostly commenting on the wow! factors in some of the spectacular action sequences (you know it’s animation, but it all looks so realistic). With adults, mostly comment on the computer-aided animation along the lines of “amazing, how did they do that,” etc. The Incredibles is an astounding film from the tech point of view (of course, that’s what I tend to notice most). The animation is truly breathtaking. This film takes computer animation to a whole new level of skill and what’s possible. Two of the things that really caught my eye, for instance, were the realistic hair on the characters – no question, it looked absolutely real – and the fantastic high resolution look to everything: the kind of rich, beautiful images you now see on those new (completely unaffordable) high-definition flatscreen TVs. Yet this was a film projected on a screen in a cinema. The Incredibles must be on the list for the next Oscars for best animated film, if not best film. Do go and see it. It’s out in most of Europe now: check the release dates page at IMDB for info. Notice that I didn’t describe the film once as ‘incredible’! The news this morning of the burning down of a mosque in the eastern part of The Netherlands is the latest worrying development here following the murder of Theo van Gogh, the controversial Dutch filmmaker who was gunned down in Amsterdam on 2 November. There have now been more than 20 incidents like this in various parts of the country following van Gogh's murder, not only mosques: Christian churches and schools have also been attacked. You don't attack mosques and churches. You don't attack people who voice their opinions. Everyone should be aware of the rules in this country. No violence. Freedom of expression, freedom of religion and other fundamental rights are the cornerstones of the rule of law and democracy. They apply to everyone, at all times. We will not tolerate violence or threats by people and groups who challenge those fundamental rights. Anyone living in The Netherlands must respect those rights and accept our legal order completely and without exception. To me, one of the alarming things is the threat all this poses to the long tradition of liberalism and freedom of expression that exists in this country, and which makes it one of the most pleasant, free and safest countries in which to live. That legal order is the only way to preserve our society peacefully, with all its different opinions, convictions and lifestyles. The government has to be resolute in defending those fundamental rights. That is why we are taking firm measures. We are extending our system of security and stepping up investigations of people whose extreme behaviour and contacts pose a threat to the rule of law in our country. You can read Balkende's complete statement. I can see The Netherlands becoming yet another battleground in the war of religious ideologies that simply shows the continuing lack of understanding and acceptance just about everywhere you look of the beliefs of others, Christian and Islam. If you'd like some insight into why van Gogh's film, Submission - a critical portrayal of the treatment of women under Islam - has been at the center of so much upset and was the catalyst that led to his murder, just take a look at the film. It's 11 minutes long, in English with Dutch subtitles. It plays in Windows Media Player, Real or Quicktime.